The Spectronika copper vapour laser is a low cost, high power, air cooled laser. The laser uses a sealed tube design which lasts for approximately 800 hours of operation before the tube requires replacement. This paper covers step by step instructions for the tube change procedure. Place the laser on a clean flat working surface with plenty of space around it so you will have room to work. You will need Philips and flat-blade screwdrivers and an 8mm wrench or a small adjustable wrench. CAUTION: This laser operates at high voltages. Laser tubes can act as a capacitor, holding a charge for some hours after they are last energised. As a precaution, you should insure that the laser has been turned off and unplugged for 6-10 hours before performing this procedure. You should ground the frame of the laser and use a test lead to briefly connect the electrodes of the laser tube to the grounded frame to insure there is no residual charge on the tube. Remove the cover of the laser and set it aside along with the screws that hold it in place. 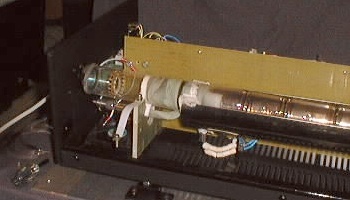 The laser tube, inside the heater jacket, is now accessible. 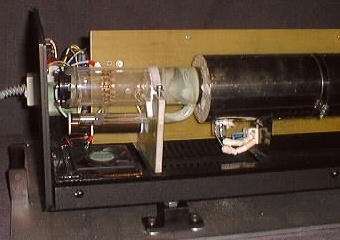 At either end of the laser tube you will find small "side-arms" below the tube. These terminate in a metal cap with a bolt extending from each cap - these are the electrodes which supply the high voltage to the tube. 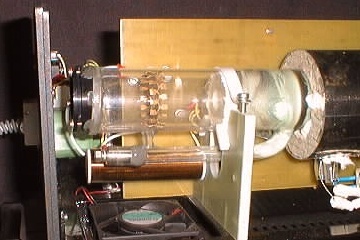 The photo above shows the side-arm and electrode at the reflector end of the tube - there is a similar assembly at the output end of the tube. Carefully unscrew the nuts on the electrodes at each end of the laser tube using an 8 mm wrench or a small adjustable wrench. Each electrode has a nut, a lock washer, a flat washer and a ring terminal with an attached wire. Set the nuts and washers aside and slide the ring terminals off the electrodes. Use care so as not to bang the main body of the tube with the wrench, or apply excess torque to the electrodes. The photo above shows the bolt extending from the electrode after the wire has been removed. The white wire and ring terminal can be seen hanging down below the electrode [just above the cooling fan]. There are two clamps that hold the heater jacket in place around the laser tube. Remove these screws, nuts and washers and set them aside. Carefully open the clamps and remove them from the heater jacket. The photo above shows the clamps after they are unscrewed and opened and before they are removed from the heater jacket. Carefully remove the top cover of the heater jacket by lifting it straight upwards. There are two segments of insulated packing material, one at each end of the tube. These may fall off when the cover is lifted. Recover these and put them aside with the top of the heater jacket. The tube is now exposed. In the photo above, you can see the exposed tube and the packing material around one end of the heater jacket. This laser was dropped and broken during shipping - normally the tube should be intact. The tube is secured in place by means of an insulated strap screwed into an insulated stand at each end. Unscrew and remove the back screw completely from each tube stand. Now slack off the front screws 3-4 turns. The holding clamps can now be rotated so that they are no longer over the tube. In the photo above, you can see the holding clamp has been rotated so that the tube is now free and can be removed from the laser. Carefully remove the tube by lifting it straight up and away from the laser. Take care not to disturb the small glass thermocouple tube which is located at the output end of the laser tube. Set the old tube aside on a clean dry surface. The new laser tube is wrapped in plastic inside a foam filled cardboard box. This is in turn inside a foam filled wooden box. Carefully remove the wrapped tube from the cardboard box being careful not to put any stress on the tube and not to bump the side-arms against the boxes as it is removed. CAUTION: All laser tubes are fragile and should be handled with extreme care. The Spectronika tube has the output optic permanently installed and aligned - care must be taken not to bump or disturb this alignment in any way. Do NOT handle the new tube with your bare hands, handle it through the plastic wrap or while wearing disposable surgical gloves or cotton gloves to avoid contamination of the tube surface. Set the tube on a clean working surface being sure not to bump the side-arms in the process. Carefully cut the tape holding the plastic in place with a sharp knife so that the tube can be unwrapped. Leave the tube in the plastic for now, provided you can freely remove the plastic from around the tube. This is to protect the optics from any dust and dirt until the tube is installed in the laser. Determine the output and reflector ends of the tube - the output is the clear glass end while the reflector has a black mirror assembly. The output should face the aperture in the front end of the laser, while the reflector end faces the 3 small holes in the back plate. The photo above shows the clear glass window at the output end of the tube facing the aperture in the front plate from which the beam is emitted. Holding the tube by its plastic wrap, carefully place it on the two insulated stands with the side arms straight down - take care not to bump the side-arms against the stand as it is put in place. Do NOT handle the new tube with your bare hands, handle it through the plastic wrap or while wearing disposable surgical gloves - this is to avoid contamination of the tube surface and optics with skin oil residue. Make sure the side arms are centred in the space below the plastic insets on which the tube rests in the stands at either end. Swing the insulated hold down clamps back over the tube and secure them in place with the screws. Do NOT over-tighten these screws as excess pressure will crack the tube - when the tension is correct, the tube can be rotated in it's stands only with some effort and can not be rotated freely. 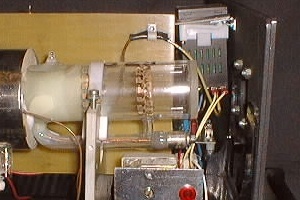 Check to see the the small glass thermocouple tube is parallel to the tube in the bottom quadrant at the output end of the tube. The thermocouple should not touch the tube, but be held in place by the insulated packing material and the laser tube so that it is parallel to the tube. The photo above shows the new tube clamped in position in the stands and ready for the installation of the heater jacket. Place the two pieces of insulated packing material in position at either end of the tube. Carefully place the cover of the heater jacket in place, making sure the tabs on the jacket top hold the insulated packing material in place and against the tube such that they form a seal around the tube in conjunction with the two pieces of insulated packing material that remained in place in the bottom segment of the heater jacket. When the top of the heater jacket is in the correct position, re-install the two clamps around the heater jacket. Put the bolts in place, slip the washer over the bolt, and thread on the nut. Make certain that the clamps are positioned in such a way that they do not block any of the vent holes in the heater jacket. Tighten the clamps until the heater jacket is firmly held in place - do not over-tighten as you will distort the heater jacket. To re-assemble the connections to the electrodes at each end, first place the ring terminal on the electrode bolt, followed by the lock washer, followed by the flat washer, followed by the nut. Hand tighten the nuts at each end. Using the 8 mm wrench or adjustable wrench, tighten the bolts on each electrode - use care in this procedure so that the wrench does not contact the main body of the tube, or that the tightening of the the nuts does not cause the tube to rotate in it's mount. CAUTION: Do NOT over-tighten these nuts as this can cause damage to the electrodes or break the tube. Inspect the laser and make sure that all the parts are back in place and accounted for. Check the hour meter on the rear of the laser and write down the date and the hours shown on the meter on a strip of masking tape. Affix this to the inside of the back plate of the laser so you have a record of the tube change. Power up the laser and wait until the high voltage is automatically applied. Carefully inspect the electrode assembly [without getting to close] to insure that there is no arcing in the connections. The photo above shows the newly re-tubed laser under test - the masking tape with the tube change information can be seen on the back plate of the laser. Once the laser has been tested for 15-20 minutes, shut it down and allow it to cool. Replace the main cover on the laser and screw it in place. The laser is now re-tubed and your can enjoy another 800 hours of emerald green and gold beams. The procedure above takes about 90 minutes if you work slowly with care and caution, double checking each step. It can be accomplished in under an hour if you are experienced and have all the tools at hand.